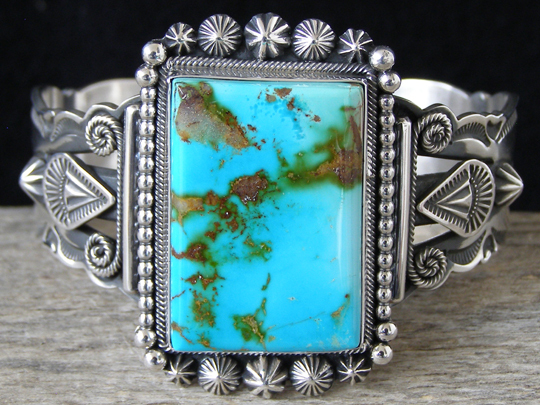 Aaron Toadlena Royston Turquoise Bracelet size 7"
This is a large rectangle of beautifully cut and polished natural, untreated Royston turquoise from Nevada. Aaron decorated this bracelet with rows of starred buttons above and below the stone. To the left and right of the stone, vertical lines of raindrop wire complement this stone. This is fine, tight-grained stone that lends itself to a glassy smooth polish. This is fine silversmithing coupled with a sensational stone. The cuff is split into three narrower bands behind the stone. Aaron's large-pattern stampwork decorates the cuff to the terminals, while accenting stampwork traces the sculpted edges of the cuff. Hallmarked with a palm of a hand with the initials A.T. inside it and stamped .925. Stone: 1 1/4" x 7/8"
Width at center stone: 1 13/16"
Width of cuff at terminals 1/2"